I was literally jumping for joy last Friday night as I finally figured out all of the proper settings for lighting on my new fancy video camera. And I was able to make a good looking video in my woodshop!!! I must have spent a solid 20 hours trying to figure out how to set the camera, and was even to the point of hiring in-person help. 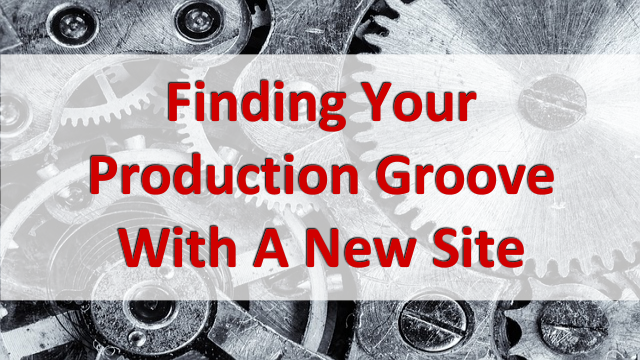 And boy, did all of that frustration and loss of time put me in touch with what new site owners go through when they are trying to learn how to do something specific with WordPress or their sites!!! It’s so much cheaper to hire qualified help and learn in a step-by-step manner that is specifically tailored to your needs than to waste tons of time searching for free, disjointed info that usually doesn’t give you all you wanted to learn for your application. I offer 1-on-1 training at BlogAid for this reason. I ended up calling Canon support and gosh are they nice!! They told me about a setting that is exclusive to the camera I have and it made a whale of a lot of difference to set it. I didn’t find that info listed in any tutorial, not even those for the camera model. Plus, they helped me realize that having a solid white wall background, with me in dark clothing, and then moving wood around that would reflect high spots of light, was really pushing the auto focus on the camera to its limits. Once I picked one focal point, all of it worked!!! Well, at least the lighting settings quit jumping around and stayed like I put them, and that was the main issue. So, it’s not perfect lighting quality, but it allows me to just use the overhead LED bar lights I got for the shop and keep everything in general focus. And I’m finally good to go with making videos! As you might recall from earlier posts in this series, videos are at the tip top of my list of content to create. So, getting over this hump was a huge deal!! I’m just now getting a real handle on the pattern I want to use for the posts. You know, the way I want to layout the info into sections. It’s wildly different from BlogAid posts. So is the video production, including the editing. For these bench build posts I’m currently making, I have to include SketchUp drawings, materials list, cut list, tool lists, and step-by-step directions. For the videos, it’s a long show-and-tell in one take and a different kind of editing between the segments. It’s taken me the last couple of weeks to figure all that out, but I’m definitely establishing a groove and looking forward to publishing regularly soon. I’m also looking forward to getting all these builds done so I have a functional shop!!! Earlier in this series I also posted about how I’m creating an editorial calendar for the woodworking site. And I listed 15 ways I plan to repurpose content on the current mitre saw station build. Well, what I’m discovering as I go is that I pretty much have to pre-plan the order of posts to make all of this work. That means I have to start at the end, with the final build. And then I have to work my way back through each step and determine the natural segments I want to do an individual post on. In short, I have to already know what I want to do to know what I want to do. I don’t think that’s something a brand new blogger can even contemplate trying to do. I think it takes at least a full year, maybe two, of blogging to find your voice and way of doing things. And then it takes time to study others in the niche and have enough of a base understanding of blogging and promoting to successfully copycat them with your own twist. Look at me – I’m an experienced blogger and vlogger and it has still taken me 3 months to work this stuff out for the new site!! I’m 100% positive it would take me at least a year to figure all this stuff out with the tech, the content, the social media, SEO, and more if I didn’t already have such a solid foundation to start with. I’ve also seen plenty of bloggers start a whole new site once they got their feet wet on their first site and learned all the stuff they didn’t know that they didn’t know when they started out. That’s the point where folks find me. And those are the clients I cater to. I wish there were a way for more site owners to avoid those first year pitfalls and expenses, but most don’t. And most don’t survive past their 2nd year either. They work themselves silly and get nowhere. Think about how many kids play football including Pee Wee leagues all the way up through college teams. Same is true with site ownership. There were 5,212,899 new websites created last year. There are 1,630,322,579 sites on the web. The fact that you’re still in business and working on your site and making money is a big deal. Celebrate that you are one of the few to actually reach an audience that stays engaged with you. I’ve found my groove with BlogAid. I’ve got a way of delivering content that my peeps like. And I believe I know what they want and need. That means I’m constantly keeping up with everything related to site tech, including fads. I’m still figuring some of that out with Heartwood Art. But, I have enough of a foundation to know that I will be able to develop it into a money-making site with a loyal audience base. It will just take time and effort, and I’m willing to give it both. How long did it take you to feel like you had this blogging thing down? What were some of the highs and lows you experienced along the way? What strikes me the most is your “writing power” if you allow me the expression. You are capable of writing hundreds (thousands, I think) of words every week, which is outstanding. And I cannot remember since how many years I am trying to keep up with reading your “Niagaratic” (and super useful) avalanche info each time (LOL). I do not know how profitable your blog is, but I would suggest to transform your posts / pages in ebooks / paperback books somehow. Or maybe to write some from scratch. You would rock. After I gave up somehow with feeding my own blog and decided with my wife Cristina to write full-time books and ebooks, I am pretty sure you would generate residual income as well, harnessing this “writing power” and transforming it into epub and pdf files. I know you already have a super schedule with your wood shop, but well… food for thoughts or “join the dots”, as Steve Jobs said. Thanks Olivier!!! I appreciate your kind words. I used to do ebooks, but tech changes too much for that and I’d rather not have to keep something like that updated. Much better in a fleeting blog environment.